View of Ruby Rumié, Weaving Streets, NH Galería, 2016. “Weaving Street” was a phrase used by grandmothers to describe those who walked the streets of the city often, and therefore, became the title of this project. A series of photographs, a video, a poster, and five volumes on Cartagena’s ambulant street vendors comprise this arresting exhibition opening at the NH Galería, where the artist’s goal is to present new views on the vendors and their environment. The viewer’s encounter with these women will be different for the exhibition—it will be special, as will be the women’s encounter with their own images. “Problems such as gender violence, gentrification, social barriers and discrimination constitute a constant concern which I attempt to uncover through my work, by means of large installations where I use repetition as a platform for protest; bodies as objects of mass consumption that reveal the disappearance of our intangible heritage, and photographs to suggest the enigma of social stratification, all of these intend to stimulate reflection, playfulness, visual pleasure, emotion and inquiry” explains Rumié. Born in Cartagena de Indias, Ruby Rumié studied painting, drawing and sculpture at the School of Fine Arts (1980–82). From 1989 to 1996 she worked the technique of hyperrealism painting. She later breaks with the academy and incorporates social and territorial heritage into her work, questioning the commitment of the artist with society. 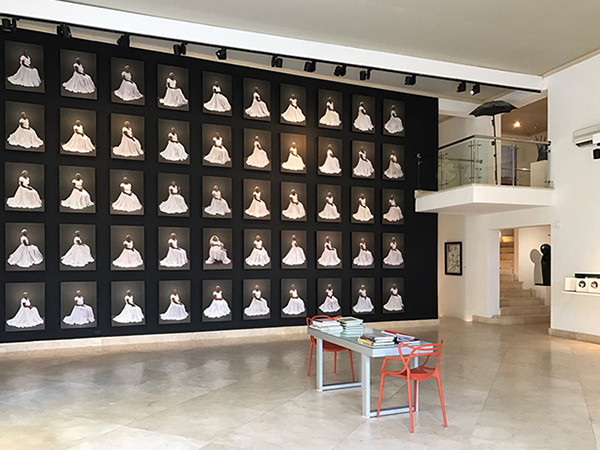 Rumié has held important exhibitions in Colombia, Chile, United States and France. She participated in the First International Biennial of Contemporary Art of Cartagena de Indias, and was recently granted a scholarship by The Rockefeller Foundation Bellagio Center, where she completed the last stage of the Weaving Streets project, during a residency of four weeks.